Quick Note: The TOTO S550e and TOTO S500e are identical, except that the S550e has an automatic opening/closing lid and LED night light. Besides that, the two models are exactly the same. From the original pioneer of the electric bidet seat, we are pleased to offer TOTO's latest model, the TOTO S500e Washlet. In addition to the many high-end functional features included with this new model, TOTO has also created two different looks for customers to choose from with the Contemporary and Classic designs. The two designs simply have different lid styles you can choose depending on your aesthetic preference, but both versions are equipped with all of the same great features. This bidet uses a tankless water heating system for continuous warm water with adjustable temperature for both the posterior and feminine wash. It also has adjustable nozzle position and water pressure as you would expect. The oscillating feature moves the wash nozzle forward and backward during the wash cycle to cover a larger area for more effective cleaning. There is also a pulsating massage wash that alternates the spray pressure from strong to soft for a soothing effect. A warm air dryer and adjustable temperature heated seat add extra comfort and function for users. 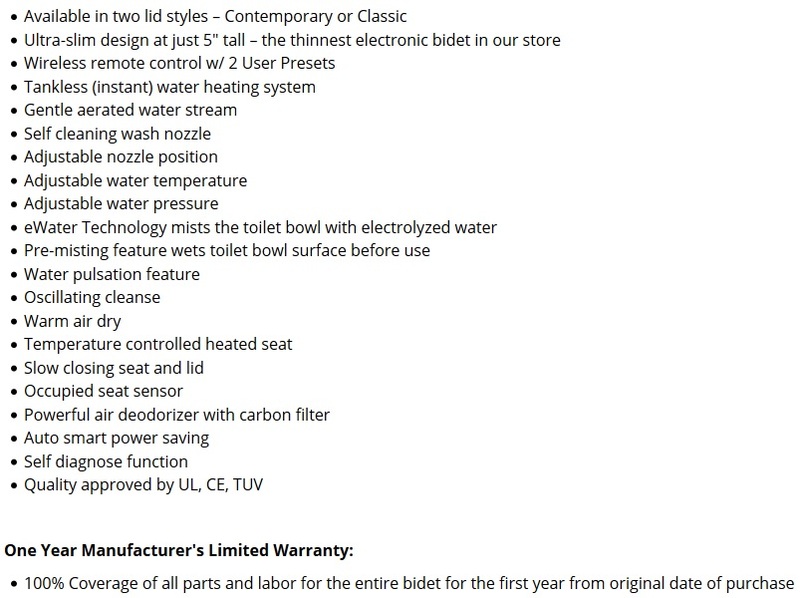 The S500e is equipped with a unique toilet bowl cleaning feature that uses electrolyzed water, also known as eWater. 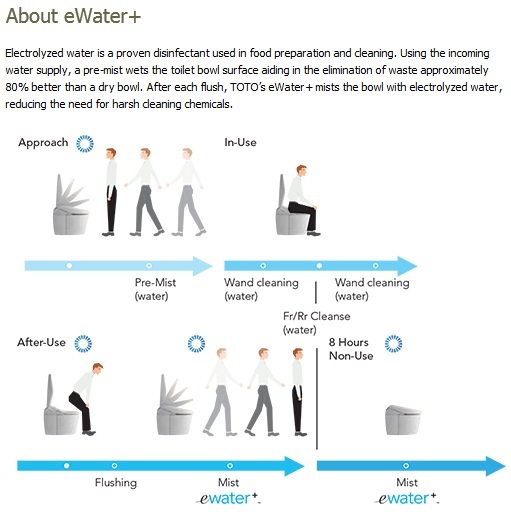 This eWater function adds an extra level of clean to your toilet by spraying a mist of electrolyzed water onto the surface of the bowl after every use as well as after every eight hours of non-use. Plus the wash nozzle is also self-cleaning. So in addition to keeping you clean, the washlet also does a fantastic job of keeping itself and the toilet clean. Additionally, the S500e includes a built in air deodorizer, slow-closing seat and lid, two separate user presets as well as a power saving mode to minimize power consumption. The bidet is operated with a remote control which has a slimmer and sleeker design over previous remote models. All of these features packed into one of the slimmest body designs of any washlet make the S500e a fully-loaded bidet seat in both form and function. Available in Cotton White and Sedona Beige. Elongated Size only. If you need Round Size, please see TOTO S350e. The following link will take you to our official write-up of this seat: bidetsPLUS TOTO S500e Review. But we've also prepared some more informal thoughts in our editor's note below. TOTO has done something unique with the new S500e (as well as it's "big brother" the S550e) by offering two different design options - the Contemporary and the Classic. There is no difference in features, only the design of the lid is different. The Contemporary design has a clean line edge to the lid for a smooth singular look, whereas the Classic design lid has a beveled edge that adds a bit of depth to the appearance. Having the two design options lets you more easily match the aesthetic of your toilet and bathroom. The S500e provides rear cleansing for posterior wash as well as front cleansing for feminine wash. The rear cleansing has a regular spray as well as a rear "soft cleansing" mode that utilizes a gentler wash spray for users who may be more sensitive to the spray stream. Similarly, the front cleansing has a regular spray and a "wide front cleansing" for a wider spray for those who prefer a broader and gentler stream. These functions make for a nice addition to the adjustable water temperature / water pressure / nozzle position that are fairly standard for an electric bidet seat. The tankless water heating system lets you wash for as long as you like without running out of warm water. A pulsating spray feature provides a strobe-like spray action as the water quickly fluctuates between low and high pressure for a massage effect. There is also an oscillating function, a popular feature which moves the wand back and forth during the wash cycle. The oscillating function is commonly used so that a larger area is washed and a more thorough cleaning achieved. All of these features are operated via the S500e remote control. The remote is a thinner incarnation from the previous generation S300e remote control, so it is a bit easier to handle. A wall mounting cradle holds the remote so you can operate from the cradle or hold it in your hand. The remote is two-sided, with the most commonly used operations on the front side while the back side has a menu for less often used functions and adjustments of settings. You will rarely need to use the back side after you have initially set up your washlet settings. The eWater feature really differentiates the S500e from other bidets in how it helps keep the toilet itself cleaner and more sanitary. Electrolyzed water acts as a disinfectant and is found in many restaurants for cleaning. The eWater function works by misting your toilet bowl with a pre-mist before use to moisten the surface of the bowl which helps prevent material from adhering to the surface. The unit then sprays a mist of the electrolyzed water on the bowl surface after each use as well as every eight hours of non-use. This misting helps diminish how much manual cleaning you need to perform as well as the amount of cleaning chemicals you need to use on your bowl. Other non-wash features include a built in air deodorizer which uses carbon filtration to remove particles that cause unpleasant odors from the air. There is also a warm air dryer with adjustable air temperature to help dry off after washing. The seat is also heated with adjustable temperature so you can have it warm in the winter and turned to lower temperatures or turned off during the summer. The S500e has a slow closing seat and lid. It should be noted that only the S550e has the automatic opening and closing seat and lid function; the S500e seat and lid must be raised and lowered manually. This S500e was purchased to replace an old unit that after 12 years of service was starting to occasionally not work properly. The S500e with "bowl spray" & "bowl light" and a much smaller remote is a significant improvement. When I enter the toilet area and the bowl light illuminates and the bowl spray commences, I feel like my Toto is saying "hello, ready for service." Great product. Excellent personal service you will wish you bought earlier. I have only had this product for about 10 days, but so far so good! I am still exploring all the options available. So far I love it and it does everything I wanted. It seems very customizable, with easy adjustments to water temperature, position of front and rear wash, and strength of the water flow. One reason I bought this particular seat is because it is pretty low profile (doesn't stick up very high off the bowl). I am happy with how it looks on my toilet in Sedona Beige. This seat is awesome. Came across one during my travels and had to get one. I got the modern lid and it looks super clean and nice. Luxury bathroom upgrade for sure.